The Chattahoochee-Oconee National Forest in northern Georgia comprises two National Forests, the Oconee National Forest and Chattahoochee National Forest. The Chattahoochee National Forest takes its name from the Chattahoochee River, whose headwaters begin in the North Georgia mountains. The river and the area were given their name by the English settlers, who took it from the Cherokee and Creek living there. In one dialect of the Muskogean languages, Chatta means stone; ho chee, marked or flowered. These marked or flowered stones were in the Chattahoochee River at a settlement near Columbus, Georgia. In the northwestern portion of the Chattahoochee, the mountain peaks are lower and shaped in long, narrow ridges, separated by valleys. These valleys have been used for centuries as human and animal passageways. Civil War battles were fought here as Union General William Tecumseh Sherman led his troops toward the battle of Atlanta. The combined total area of the Chattahoochee-Oconee National Forest is 865,855 acres (3,504 km²), of which the Chattahoochee National Forest comprises 750,502 acres (3,037 km²) and the Oconee National Forest comprises 115,353 acres (467 km²). The county with the largest portion of the forest is Rabun County, Georgia, which has 148,684 acres (601.7 km²) within its boundaries. The mountainous Chattahoochee National Forest includes Brasstown Bald, Georgia's highest peak at 4,784 feet. Trails traverse the mountain and the observation deck offers panoramic views of mountains and valleys. Unlike the tall peaks of the Chattahoochee, the Oconee National Forest is relatively flat with small hills. The Chattahoochee National Forest covers 18 north Georgia counties. It has five ranger districts, with two of them—the Tallulah and the Chattooga—being combined. It includes over 2,200 miles (3,500 km) of rivers and streams (including about 1,367 miles (2,200 km) of trout streams). There are over 450 miles (720 km) of hiking and other recreation trails, and 1,600 miles (2,600 km) of "roads." In addition to the Chattooga River and the headwaters of the Chattahoochee River, natural attractions within its boundaries include the beginning of the 2,174-mile (3,499 km) Appalachian Trail; Georgia's highest point, Brasstown Bald; and Anna Ruby Falls. The Oconee National Forest is spread over 8 Georgia counties and is organized into one ranger district. The Oconee Ranger District maintains several hiking and other recreational trails in the forest. Forest headquarters are located in Gainesville, Georgia. Spanish conquistador Hernando de Soto passed through northern Georgia in a futile search for gold. In fact, the United States' first frenzied gold rush did come in the region in the early nineteenth century, leading to a land grab that resulted in the Cherokees' Trail of Tears as they were displaced to western territories. In 1911, after the Weeks Act allowing the purchase of land east of the Mississippi River had passed Congress, the United States Forest Service purchased 31,000 acres (125 km²) of land denuded by hydraulic mining and logging from the Gennett family for $7 per acre. This land was the beginning of what would become the Chattahoochee National Forest. The initial land purchases became part of Cherokee National Forest on June 14, 1920. Ranger Roscoe Nicholson, who was the first forest ranger in Georgia and had advised the Forest Service in its initial land purchases, continued the growth of the Chattahoochee by negotiating the purchase of most of the Forest Service land in what is now the Tallulah Ranger District. The Coleman River Scenic Area near Clayton, Georgia, was dedicated to "Ranger Nick," as he was called, in honor of his promotion of conservation ideals. Ranger Arthur Woody also promoted conservation and was a key figure in the early development of the Chattahoochee. Unwise land and resource use had caused the deer and trout populations to virtually disappear in the North Georgia mountains, and Woody brought trout and deer back to the area. The trout were shipped to Gainesville, hauled across the narrow, dirt, mountain roads and eventually released in the streams. Woody also purchased fawns with his own money and fed them until they could be released on what became the Blue Ridge Wildlife Management Area. Many landmarks in the Chattoochee bear Ranger Woody’s name in tribute to his work. Sosebee Cove, a 175 acres (0.7 km²) tract of prize hardwood, is set aside as a memorial to Woody, who negotiated its purchase for the Forest Service. During the Great Depression, the Civilian Conservation Corps planted millions of trees on Georgia forest land devastated by hydraulic mining and lumber companies. On July 9, 1936, the Forest Service was reorganized to follow state boundaries and President Franklin D. Roosevelt proclaimed the Chattahoochee a separate National Forest. In 1936, the Chattahoochee was organized into two Ranger Districts, the Blue Ridge and the Tallulah. The reforested land helped Georgia's economy and the war effort in the 1940s. Along with lumber now harvested from the once barren forest land, the Chattahoochee National Forest also produced paper, turpentine, waxes and polishes, and fragrance. After the war, hunters, fishermen, hikers, and campers began to regularly visit this outdoor paradise. 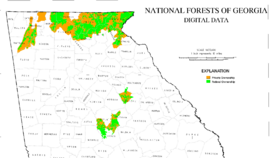 In 1959, President Dwight D. Eisenhower proclaimed 96,000 acres (388 km²) of federal lands in central Georgia as the Oconee National Forest. The Oconee joined the Chattahoochee to become the Chattahoochee-Oconee National Forests of today. The Chattooga River was designated a Wild and Scenic River during the 1970s. The Chattooga remains one of the few free-flowing streams in the Southeast and is known for its white water rafting and beautiful scenery. The movie Deliverance was filmed on the Chattooga River. Wild rushing rivers, cascading waterfalls, ten wilderness areas, 1,367 miles of trout streams, and 430 miles of trails enrich the Chattahoochee National Forest. The 2,135-mile Appalachian Trail begins here. Four long-distance trails on the Chattahoochee are great for backpacking: The Benton MacKaye (53 miles), Bartram (37 miles), Duncan Ridge (35.5 miles), and Appalachian (79 miles). The Chattooga Wild and Scenic River is popular for guided rafting trips. This premier whitewater river offers some of the most challenging rapids in the Southeast. The Chattahoochee and Toccoa rivers are popular for canoe or kayak. Unlike most Georgia rivers, the Toccoa flows north instead of south and is considered by many to be the state's loveliest river. Lake Blue Ridge is the only place in Georgia where anglers can catch muskellunge. Nottely Lake, Lake Chatuge, Lake Burton, and Lake Rabun provide good trout and bass fishing. Other fish to be found are walleye and bluegill. The Ridge and Valley Scenic Byway is a 47-mile loop through the Armuchee Ridges. "Armuchee" is a Cherokee Indian work meaning "land of flowers," an accurate description. John's Mountain Overlook has outstanding views reaching into Alabama and Tennessee. 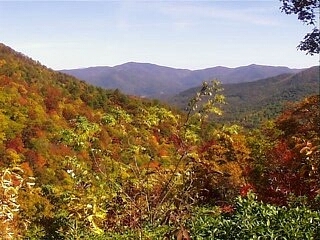 Spectacular autumn colors line the Russell-Brasstown Scenic Byway. 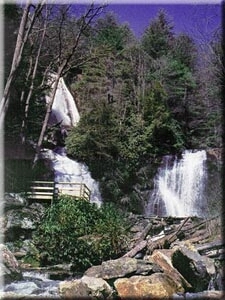 Anna Ruby Falls, a double waterfall, cascades off Tray Mountain in a spectacular 153-foot drop. Game is abundant for hunting in the Oconee. Lake Sinclair is popular for swimming, fishing, boating, and camping. Spring catches of red-breast sunfish, particularly in the Ocmulgee River, are considered exceptional. Lake Oconee is well known for its crappie and other fish. Near Lake Oconee, an easy 1-mile trail leads to one of Georgia's ghost towns, Scull Shoals. The site of Georgia's first cotton gin and paper mill, Scull Shoals, is a crumbling ghost town near Lake Oconee. Tumbling walls and other ruins still stand amid lush forest. A short trail nearby leads to two prehistoric Indian mounds. Atlanta's urban sprawl is already touching the southern part of the forest. Other threats include the acid rain that falls during the summer due to air pollution. The road-building that occurred to allow logging companies access to the forest has damaged sensitive areas, and some land is now being redesignated as roadless. Southern pine beetle infestations are on the rise, destroying wildlife habitat. The use of banned all-terrain vehicles causes damage as well. By creating rutted trenches or trails on hillsides, these vehicles cause soil erosion, which leads to sediment seeping in streams. This in turn affects water quality as well as the health of fish and other life in the water. Mud-bogging by ATV riders has also caused serious damage to many wetland areas. State, county, and local governments, along with private citizens, are working to protect the forest by adding to the acreage that is protected through purchases and donations. ↑ North Georgia, Chattahoohee National Forest. Retrieved January 8, 2009. ↑ USDA Forest Service, Southern Pine Beetle Briefing Paper. Retrieved January 7, 2009. ↑ USDA Forest Service, July 22, 2008, Illegal ATV Use Damaging National Forest Lands in Georgia. Retrieved January 7, 2009. North Georgia. Chattahoochee National Forest. Retrieved January 8, 2009. United States. 1984. 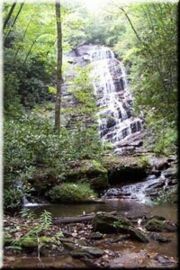 History of the Pocket Recreation Area, A.: Armuchee Ranger District, Chattahoochee-Oconee National Forest. OCLC 43956197. United States. 2004. Chattahoochee-Oconee National Forests. Management bulletin R8-MB, 113, A-F. [Atlanta, GA]: U.S. Dept. of Agriculture, Forest Service, Southern Region. OCLC 54471453. USDA Forest Service. Chattahoochee-Oconee National Forests. Retrieved January 8, 2009. 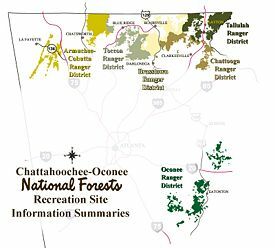 History of "Chattahoochee-Oconee National Forest"
This page was last modified on 7 February 2017, at 16:37.